When I think of an ice cream float, I'm immediately transported back to my childhood. Root beer floats were 100% my thing. Something about that classic combination was completely irresistible. There's nothing better than a sweet and creamy float on a warm spring or summer day. Now that I'm an "adult" (I use that term very loosely) I trying to find a balance between eating healthy and enjoying a sugary treat can sometimes be a struggle. Well, now you can feel a little bit better about treating yourself with a refreshing and delicious kombucha ice cream float. I work for Perry's Ice Cream, a local WNY company, and we recently partnered with fellow Buffalo company Bootleg Bucha to create this delicious combination. I am a sucker for anything fruity, and the I thought the combination of their Blueberry Lavender kombucha and our Vanilla ice cream sounded heavenly. Unlike sugary sodas, kombucha has a great number of benefits for your body. Everything from detoxification to improved digestion to immune system simulation and everything in between. Kombucha is the most super of super foods. And the natural fizz of the drink gives you the same satisfaction that the carbonation of a root beer float would bring you. I didn't really follow any type of a recipe for this drink. 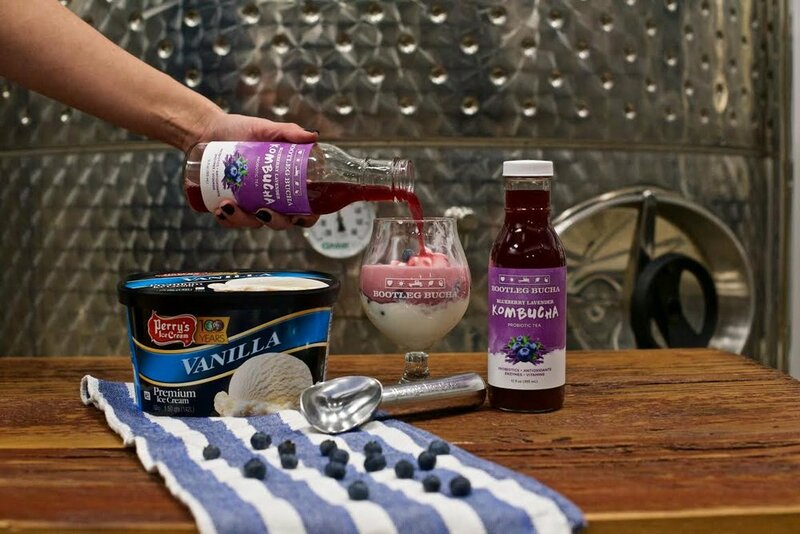 Just two scoops of vanilla ice cream, a handful of berries and a large pour of Blueberry Lavender kombucha and your have yourself a sweet treat that you can feel good about enjoying.